Sweet Briar was established in 1901 in the will of Indiana Fletcher Williams. Williams founded the school in memory of her daughter, Daisy, who had died at age 16. The College opened in 1906 with 51 students. The A.B. degree was immediately recognized by graduate programs at leading universities — and three of the College’s first five graduates went on to pursue advanced degrees. 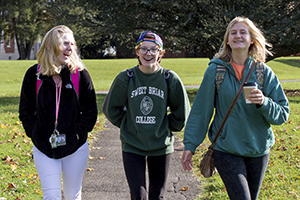 Sweet Briar is a private liberal arts and sciences college for women of consequence with an ABET-accredited engineering program and a core curriculum focused on leadership in the 21st century. Reduced tuition, a new academic calendar and research funding for experiential learning opportunities make it one of the nation’s Most Innovative Schools (U.S. News). The College’s unique community and campus life foster strength and resilience in every student by surrounding her with excellent faculty, coaches and staff who challenge her to bring her best self forward — and to own it with confidence, courage and grit..